After much time wearing an apprentice apron, I’ve graduated to the role of butcher. With this job comes the duty of talking about how to cook meat. I find it funny how much faith people place in me because I wield knives and stand behind the counter, but luckily for them I take my duties to encourage the sharing of good food seriously. It’s time I share a few of my back-pocket tricks for cooking meat on this website. I swear by the foolproof simplicity of this stove-oven technique (for cooking any kind of steaks or chops, really) and also by the tastiness of the mustard smear for a smooth finish. And when your butcher asks you what kind of pork chop you prefer, I recommend them thick-cut, from the rib end. Feeds 2, easily scalable and perfect with roasted potatoes and greens. Take the pork chops out of the fridge an hour or so before you’re going to start cooking. Salt them and allow to rest on a plate and come to room temperature. Heat the oven to 350 degrees. 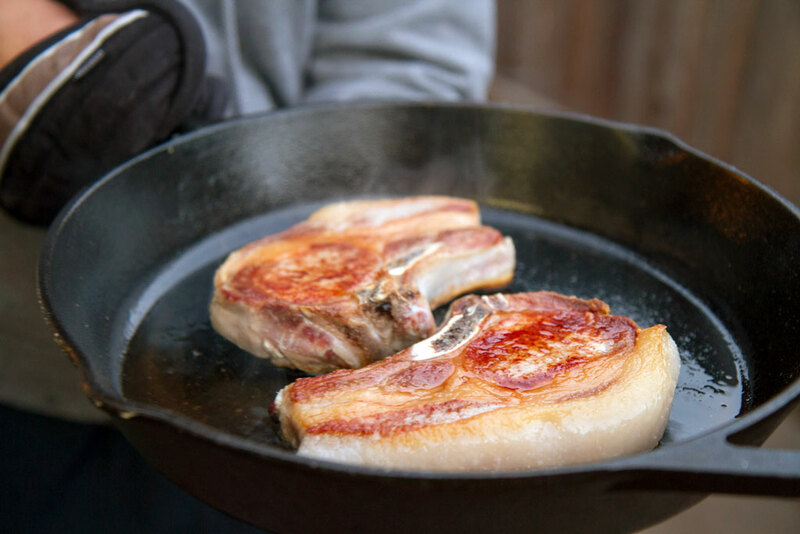 Heat a cast iron or oven-proof skillet over high heat. Add a tablespoon of your cooking fat of choice (lard or oil), allow to melt and swirl the pan to coat. 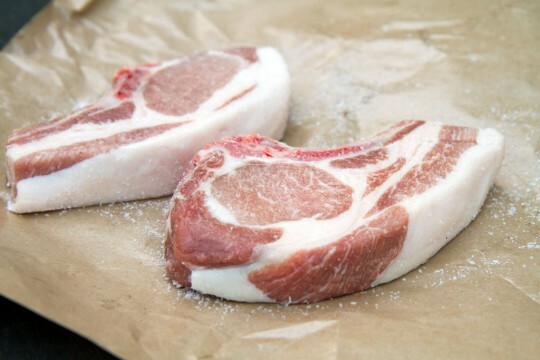 Place the salted chops in the pan and sear them, turning once, until brown and crusted, about 2 minutes per side. If there is excessive fat in the pan you can remove some before proceeding to the oven. 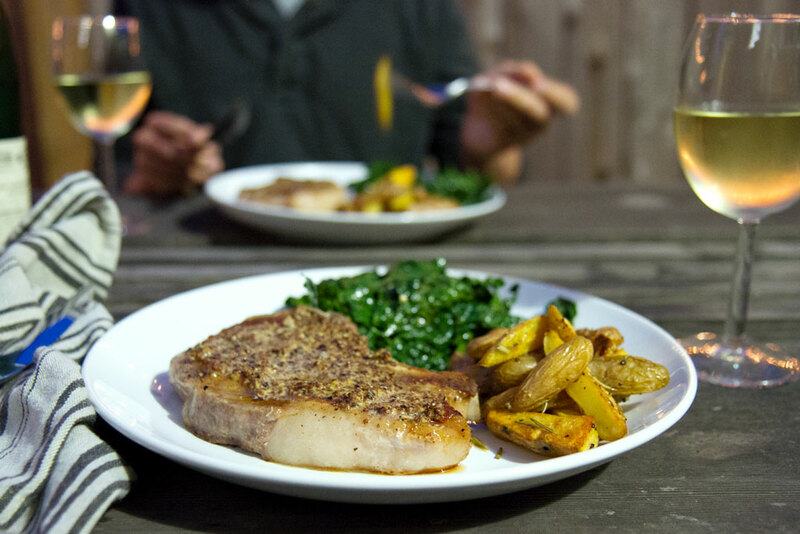 Smear a spoonful of mustard and grind fresh pepper over the top of the chops. Move the pan to the oven and allow to roast until the pork chops are just cooked through. If you’re using a meat thermometer, you want to cook them to an internal temperature of about 135-140 degrees (they will continue to cook while resting). This could take anywhere from 8-15 minutes depending on the chops. Remove the pan from the oven and put the chops on a plate to rest. After a good 10 minutes, a few more if you can stand it, your chops will have resorbed all of their delicious juices*. Serve and enjoy. *Be sure to use tongs to handle the chops. You don’t want to pierce them.